Support your immune system and optimize urinary tract health with this triple-action formula. 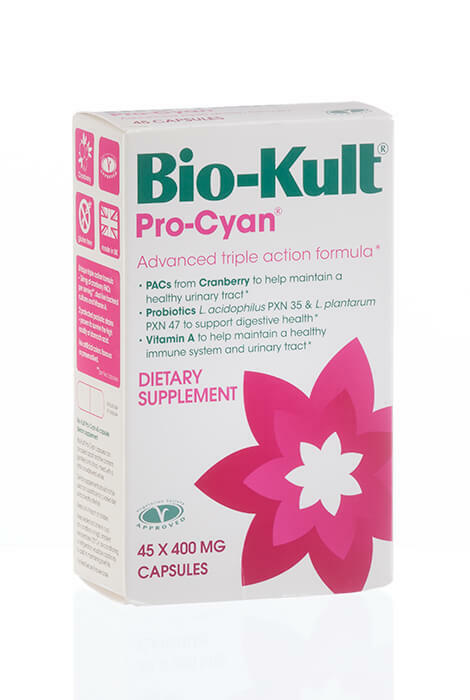 Scientifically developed with cranberry extract, two specifically selected probiotic strains, and Vitamin A, Bio-Kult® ProCyan® contributes as an immune booster and provides maintenance on the mucous membranes found along the urinary tract. The vegetarian formula is free from artificial colors, flavors or preservatives and is shelf-stable. To use, take 1-2 probiotic supplements twice daily with food. Children under 12, take half adult dose or as recommended by healthcare practitioner. Contains traces of milk and soy used in the growth of the strains. Contains 45 capsules. 1-2 capsules once or twice daily with food. Pregnancy: Bio-Kult Pro-Cyan has been formulated to be suitable for use during pregnancy, but we would always suggest consulting your doctor or healthcare practitioner before taking any dietary supplement. Children under 12: Take half adult dose or as recommended by your doctor or healthcare practitioner Do not exceed recommended daily dose. Lactobacillius acidophilus PXN® 35™, Lactobacillus plantarum PXN®47™, Cranberry Extract, Vitamin A. Other Ingredients: Cellulose(Bulking Agent), Vegetable Capsule (Hydroxypropyl Methylcellulose) Contains Milk and Soy.